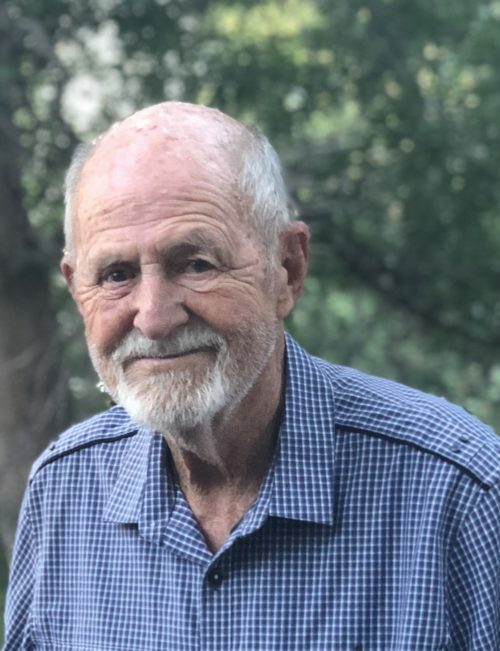 Jack Nelson, resident of Centennial, Colorado, formerly of Colorado Springs, passed away on Monday 28th January 2019 at the age of 88 years. He leaves behind his wife Helen, daughter Kirsten, and son Peter. Jack personified the best aspects of his generation. He didn't see barriers only opportunities. He never understood failure and forged ahead to realize his goals. When asked as he hand built an addition to their home based on a bunch of books he checked out from the library, “what makes you think you can build this?”, he simply and plainly stated that he would figure it out, fix it if necessary, and then moved forward. He was fearless. He was so very fearless. Only such a man could design a model of the cabin out of balsa wood and then construct it by building parts at home and then transporting them up to the high country on the top of an old Volkswagen with his only equal, his wife of 54 years, Helen beside him. Together they built a beautiful cabin and all of the furniture and features in it. Should you be lucky enough to stay at the Nelson cabin, you will understand. Jack’s presence is everywhere and in every detail. Jack held many jobs; cleaning out boilers, patrolling Pikes Peak, and fixing power lines - the man knew how to work. This was all interrupted by his enlistment in the Air Force where he served for four years during the Korean War while stationed in Japan. But it wasn’t until he returned home and earned his MPA that he really found his calling. For the next 30 years or so he was the Director of Probation Services for the City and County of Denver. He loved his employees to the point that he would often spend his time building shelves or helping out with construction at their houses. Mayor Pena bestowed upon him "Employee of the Year" for the entire city and county of Denver. To this day, we as his family consider his employees as part of our family... They are that important to him and to us. Through it all he was the consummate fly-fisherman; yet with out the pretense. No waders or high tech gear - just a vest and bamboo rod. He could throw a line over 60 feet that would just kiss the surface and always seemed to come home with a few trout for dinner. He four-wheeled for many years and then gave that up to back-packing and camping with his family. Cross-country skiing and then getting the cabin ready with coffee and pancakes in the morning was a specialty in the winter. He enjoyed a good game of golf with his friends and brother Larry when possible. Naturally he was a Denver Broncos fan and held tickets since around 1966. And some quite ferocious games of cards were common with his parents Art and Vera until late into the lantern light. Retirement came as a shock to Jack as did suddenly becoming an employee of his wife of 54 years, Helen. So for many years he hauled paste and worked on walls as Helen continued her very successful wallpapering business. When she moved on as a small garden planner, Jack was there to move flag stones, gavel and dirt from one place to another. Nothing was too much for him - nothing too difficult and nothing to much to ask. As time came on and, unfortunately, dementia began to take hold, Jack found love and solace in the grandchildren of his daughter Kirsten and son-in-law Chris; Sam and Grace. Pop-Pop was the king of every celebration. Jack loved his grand children fiercely. And wow did they love him. He knew what was coming, having seen it with his own mother, Vera. And it pissed him off. He hated it and we hated it with him. His was a beautiful mind - and the loss of it was a loss for all. But it didn't stop him. Instead, he would make you love him within minutes of meeting him - even in his latest years he was more interested in you. Around him you just felt at home. He will be missed by so many people that can't even be counted. He affected so many lives, changed so many lives, improved so many lives. He is the hero of our family. And, it turns out, a hero to quite a few others. He took those 88 years and he used them to the best affect. If you needed him, he was there for you. We love you Dad. You have always been a super hero to us. This world is better for you being in it - and a loss for your passing. We miss you, we love you - but we are also so very glad that you are at peace. The family welcomes you to make memorial donations in Jack’s name to the Alzheimer’s Foundation of America, Donate | Alzheimer's Foundation of America or any similar Alzheimer’s organization..
My deepest condolences to the friends and family of Jack. May your treasured memories of a life well lived bring you joy, and may ‘the God of all comfort’ give you strength, along with a measure of peace for your grieving hearts at this most difficult time.